Study From Home students and tutors celebrate at the 2017 ITC Graduation at the Langham Hotel in Auckland. On Friday July 21, several Study From Home students attended the ITC 2017 Graduation Ceremony at the Langham Hotel in Auckland. Held in the Langham’s magnificent Great Room, it was a stunning evening of culture, canapes, and celebrations. The 2017 theme was ‘Your Own Culture’, so everyone dressed up as something inspired by their cultural heritage. “It was wonderful to see so many Study From Home students at Graduation. They all looked fantastic!” says Richard Euston, Study From Home Team Leader. Graduation is one of the highlights of Richard’s year, as it’s a chance to catch up with students from around the country and celebrate their achievements. One student travelled all the way from Roxburgh in Central Otago. “Achieving a Study From Home qualification takes motivation, commitment, and lots of hard work. It’s amazing to be able to congratulate each student on their success,” he says. 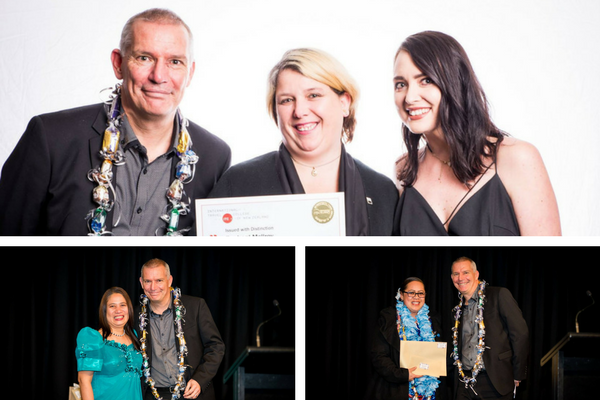 The evening began with drinks, canapes and networking, before the official ceremony opened with an impressive Kapa Haka performance by Edgewater College, followed by a presentation by guest speakers Sam Mooney and Clint Maskell from STRAY. Next, students were called up on stage to receive their certificates – their chance to shine! “Giving out certificates is one of my favourite parts of the evening. It’s great to be able to shake each student’s hand, acknowledge their amazing effort, all while their friends and family cheer from the audience,” says Richard. Richard also awarded three special awards to high performing students. After the special awards were presented, the official ceremony came to an end. Students and tutors then gathered in the foyer to take photos and say their goodbyes. Professional photos from the evening are available on ITC’s Facebook page. Don’t forget to tag yourself and your friends! Do you want to graduate with a tourism qualification next year? Study From Home is enrolling now for courses starting August 21. Apply today!